Trying to find an idea for a blog post can be a bit like feeling around for something you can’t quite get your paws on. I want every one of my blog posts to have photos and writing that is intriguing, humourous, thotful or something! I like to think I have a thick skin so I welcome honest disagreement or constructive criticism. What I can’t live with is being boring (the dreaded double b)! There I said it. Abandon the idea and start over. At some point in the blog creation process, you need to make a full commitment, dive in and hit the publish button. Eventually I force the circling to come to a merciful end. Then I face a moment of angst with my mouse hovering precariously over the publish button. The first post was the worst. That was a bit odd since I liked the post, I had no followers to be bored and there was nothing really at stake except my own standards. After 199 posts, it has become a lot easier to hit the button but I still hesitate every time. I think there are probably at least two reasons – artistic angst and errors. I suppose I put a little bit of myself out there with each post and it’s impossible to know how readers will react. This can create a little angst. I have discovered that people’s tastes and interests can sometimes vary a lot from my eclectic musings and wildlife focus. So when my mouse hesitates, I’m wondering if the post will strike a chord, or am I doing this one mostly for me? As the posts click by, I am getting more comfortable with the latter while appreciating connecting with commenters even more. The second reason I hesitate is the potential for mistakes. I want the posts to be right but gremlins keep sneaking in to add errors, half-baked ideas and unintentionally creative spellings. My favourite blunder remains miscounting the number of Canadian provinces! Somehow being in the ballpark was not comforting! Why did it happen? Likely it was the usual reason. My focus was probably on a slight tweak to a photo or finding a better descriptor while missing the big clanger! Maybe my blogging isn’t so much about rising above boring but building character – by accident. I wonder if it’s working? As I once again hover over the publish button, I think there are more reasons than usual for a little angst! After your blog is published, you realize you may have got yourself in a little deeper than planned. Krahnpix note: Watching a fox hunt for meadow voles in Yellowstone National Park continues to be a fantastic memory. 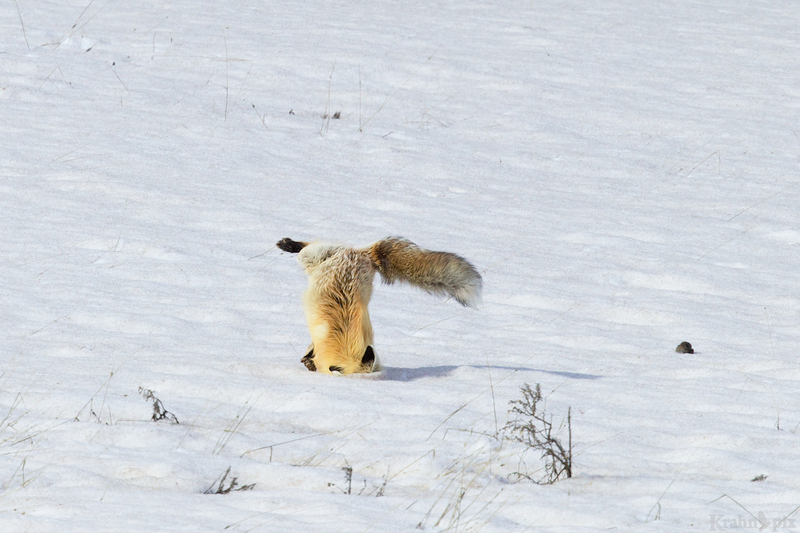 Just like blogging, sometimes the fox’s dives were successful and other times it missed the target completely and just ended up in awkward positions. I’m in good company. Yes that’s what I’m talking about. The perennial optimists never quite understand. I hope you are feeling reassured. Glancing through the comments it seems that everyone feels the way I do: we love your photos and your prose! Yes there were lots of kind and thotful comments. I appreciate you adding to them. It is unfortunate you share the same process – I would wish better for others. I struggled with the writing on this post for quite a while and I still think it could be better. However, I was out of ideas so it was time to go live. It also took a while to figure out what photos to use but I think the photos and captions are actually much better than the writing. Glad you liked them. The quest to keep improving is positive but the other side of the coin is never quite being satisfied. it’s hard to find a balance between the two sometimes. LOVE this! One of the reasons I love reading your blog — and there are many — is the accompanying story. You always find a way to add just the right amount of reflection and story which adds that wonderful extra dimension to the photos, which are always inspiring. Well done, sir, truly. I found your comments particularly encouraging. Perhaps it’s because your description is exactly what I’m aiming to achieve. Thanks for taking the time to comment. The foxes are amazing creatures and well adapted to their environment. I can’t imagine it being all comfortable diving into the snow but they show no reluctance. I suppose it helps to expect to get a great snack. Thinking back, I seem to recall the fox being successful nearly half the time. Apparently when their jump is aligned with the north pole, their success rate goes higher. Unfortunately I couldn’t find a link to that documentary. The whole process is really beyond belief. I would expect them to catch nothing given my calculation of the odds. This is why I rarely ever write a lot to go with my photos, I am simply not a very good narrator but I still go through the agony of indecision. One of things I’ve always admired about your blog is your writing, you have yet to bore me. We all seem to find our agony of indecision somewhere, don’t we? Happy to hear that my blog has stayed above the boredom sea level. HA! Far above sea level. Happy to hear I’ve staved off the bb in your mind. I appreciate your comment. Very nicely written, and you found the perfect photos for your topic, too. 🙂 It’s interesting to hear about your process – you must spend a very long time on your blog posts. It shows! It’s always a pleasure to both read and see. Thanks for this thought-arising post! I’m sure there as many processes as there individuals and we each focus on the things that are important to us. Sometimes my posts do take a long time and other times they seem to flow – I wish they were all the latter! Glad you liked the post. I appreciate your comments and hearing how someone else does it. I love this post! As a fellow blogger, I go through the whole process that you describe many times before publishing a post and it can be agonizing. Sometimes I wonder why I put myself through it all! Although I am a new follower to your blog, I always look forward to your posts for your excellent nature photography, but I am equally impressed with your witty writing. You are as clever as a fox, Lyle. Well done! I guessed that I wouldn’t be alone in my process – sorry to hear I have company! It’s funny how the thing that we are drawn to and provides so much satisfaction gets reduced to being called agonizing. I’m glad you enjoyed this posts and others. I’ll take being compared to a fox as high praise indeed. I can honestly say that your posts have never, ever bored me. Your delightful sense of humor never fails to delight. I love the fox photos. The earlier photos you posted of that encounter are some of the most memorable that I have seen in any blog and I suspected you had more that you would post eventually. It’s always a risk to put yourself and your work out in public, where they are subject to scrutiny and criticism as well as to praise and adulation. I can’t help but think of the oft-quoted notion that a ship is safe in a harbor, but that’s not what ships are for. It’s always a risk to make a posting. As I read your description of the angst associated with the production of your postings, I realized that you treat them like magazine features that must be carefully constructed and edited and proofed, whereas I treat my postings more like newspaper articles, simpler in content, put together under the pressure of time, and much greater in volume. Often I am documenting what I see and what I shoot and consequently I rarely feel angst (although I hate it when I later find typos in the text). You suspected right on the fox shots. I spent an hour there and I don’t think I’ve deleted a single shot yet. There’s still more for another rainy day post! I think your descriptions of our different approaches are exactly right. Your thotful analysis once again comes through. I had never described it as a magazine article but that’s the general target. I loved that ad. If I could aspire to that, it would be mission accomplished. I really appreciate your thotful and encouraging comments. That’s quite a amazing series of shots! I enjoy your posts, but somehow, WordPress occasionally drops people I am following off my Reader list, so I’ve rediscovered you after an absence. For me, posting a blog is the end result of something I’ve learned — either from personal observation, research, or whatever. I am less thoughtful than you about whether what I write will find a receptive audience. I find that when I get too science-y in my posts, there is less interest from readers (sort of like less kudos), but I get more pleasure from having learned something in the process. So — it all evens out in the end. Posting what you’ve learning sounds like a great approach. For better and for worse, my focus on the audience comes from spending a lot of time working in corporate communications where that was the point of the exercise. This is different but some parts of it carry over. I suspect what makes blogs go well over the longer term is not wandering too far off what you like. In your case it’s sharing learnings and for me it’s sharing the thrill of capturing wildlife and nature through a light-hearted story. The dreaded “publish” button! Do I hit it or do I do revision number four? Is this post too wordy? Is this post too short? Am I being melodramatic? Not dramatic enough? Would I want an editor to read this? Would I want an editor to miss this? Am I giving too much insight into my life? Will anyone care? I really liked post A but it got no comments. I wasn’t so fond of post B but people raved about it. Oh the agony and ecstasy of blogging!! And for the record, you are never boring Lyle. I wish I could say I had avoided at least one question off your laundry list but no, I’ve done them all multiple times. If nothing else, misery loves company as well as the agony and ecstasy. And probably closer to the truth, asking questions makes your posts better, I’ll vouch for that. Never boring? High praise indeed. Perfect photos to go with this post! Plus I read everything you wrote rather then just doing a quick zip through the pictures. Whatever you are doing… It’s working! I struggled for while trying to figure out which photos might even remotely fit but then the fox seemed to fit. Glad you agree and even made it to the end of this rather eclectic post. Happy you think what I’m doing is working though some days I’m not even sure what it is. Two things I try to remember: One there is no way that everyone (or even most) will like any given image or piece of writing I come up with. And two, I am confident that everyone will be attracted to something I create. I think you have to have that confidence, misplaced or not, that people will respond to what you create. Otherwise you’re probably putting too big an obstacle in the way of artistic creativity. Sure, you can’t predict what people will respond to, or how they’ll respond. But they will respond. I think that easily applies to your work Lyle. That’s an interesting perspective from which to approach blogging especially as it relates to artistic creativity. My approach to the latter has been making sure the post is good from my perspective and whether I would enjoy it as a reader. I will have to think about your second point. Turning it around, I can look through some people’s photo galleries or skim through their writing and not find an attraction. Thanks for making me think once again. For me, you have a nice way of telling stories and showing photos. You know, I like your posts and so many times I wanted to have at least 50% your way of telling stories but as English is not my mother tongue, I hesitate to write the words I have in my mind. As a result, I write many times just some boring post with not so sharp photos… but hope for more and more. I still try to figure our how to write some good stories. I’m glad you like my stories and photos. I dabbled in other languages just enough to know that I can appreciate that it would be a significant challenge. Good for you to keep trying and getting better. It’s amazing what practice does for photography and writing. Hopefully you get to see something like that too. I highly recommend it. Lyle, you describe the process perfectly. I figured I might not be alone! Glad to hear that on both scores. I know you well understand what it’s like to have a great experience and then relive it in memory. This fox certainly fit that bill. I feel the same way before posting. It’s hard to put yourself out there sometimes. I bet you were thrilled to get photos of the fox. We’ve only seen foxes a few times in the park, and never hunting or in the snow. Sometimes I get a thrill like watching that fox for an hour and it keeps giving me thrills every time I go back to the photos. The snow seems to be perfect backdrop for those photos. Like you I hadn’t seen many foxes at all and then this last summer I had two great encounters. These pictures are hilarious! Thank you for sharing the antics of these foxes! I feel the same way and I think you are in good company with posting. Yours are always well thought out and beautiful, as celebrated by your FP award, so no worries…just hit the “Publish” button with pride! Glad you enjoyed the photos – those are special to me. I figured I would have some company with the blogging process. It really is a strange world sometimes but I enjoy it. Thanks for the comments and encouragement. I will continue to boldly throw them out there. Do you think he possibly picked up a few tricks the last time he visited the artic? 😀 Funny guy!!! You never know where they came from:) I appreciate the comments.